What should you do if an older person complains of not sleeping well at night? Experts do believe that “normal aging” brings on some changes to sleep. (See my previous post for more on this.) Basically, older adults tend to get sleepy earlier in the evening, and tend to sleep less deeply than when they were younger. So it’s probably not realistic to expect that as you get older, you’ll sleep as long or as soundly as when you were younger. That said, although aging by itself does change sleep, it’s also quite common for older adults to develop health problems that can cause sleep disturbances. So when your older relatives say they aren’t sleeping well, you’ll want to help them check for these. Figuring out what’s going on is the always the first step in being able to improve things. And remember, getting enough good quality sleep helps maintain brain health, physical health, and mood. Recently, I did a little research to identify the top causes of sleep problems in older adults. In this post, I’ll share what I found out. I’ll also tell you about what approaches have been proven to work, to help treat insomnia and sleep problems in seniors. 1. Sleep problems due to an underlying medical problem. Although older adults do often suffer from what’s called “primary” sleep disorders, many sleep problems they experience are “secondary” sleep problems, meaning they are secondary to an underlying medical condition whose main symptoms are not sleep related. If an older person is having difficulty sleeping, it’s important to make sure that one of these common conditions isn’t contributing to the problem. Treating an underlying problem — such as untreated pain at night — can often improve sleep. It can also help to talk to a pharmacist about all prescription and over-the-counter drugs, to make sure that these aren’t contributing to insomnia. Alzheimer’s and related dementias pose special considerations when it comes to sleep, which I write about in this post: How to Manage Sleep Problems in Dementia. 2. Snoring, Sleep Apnea, and other forms of Sleep-Related Breathing Disorders. Sleep-related breathing disorders (“SRBD”; it’s also sometimes called sleep-disordered breathing) is an umbrella term covering a spectrum of problems related to how people breathe while asleep. Sleep apnea is a common condition which is important to diagnose since it’s been associated with many other health problems (especially in middle-aged adults). In sleep apnea, a person has frequent pauses in their breathing during sleep. The most common form is obstructive sleep apnea (OSA), in which the breathing pauses are due to obstructions in the breathing passages. OSA is often associated with snoring. A less common form is central sleep apnea, in which the breathing pauses are related to changes in the brain. How common it is: The likelihood of having sleep-disordered breathing disorders goes up with age. It’s also more common in men, and in people who are overweight. In one study of 827 healthy older adults aged 68, 53% were found to have signs of SRBD, with 37% meeting criteria for significant sleep apnea. Interestingly, most participants did not complain of excess sleepiness. Why it’s a problem: Studies have found that untreated OSA is associated with poor health outcomes including increased mortality, stroke, coronary artery disease, and heart failure. However, studies also suggest that these associations are strongest in people aged 40-70, and weaker in older adults. 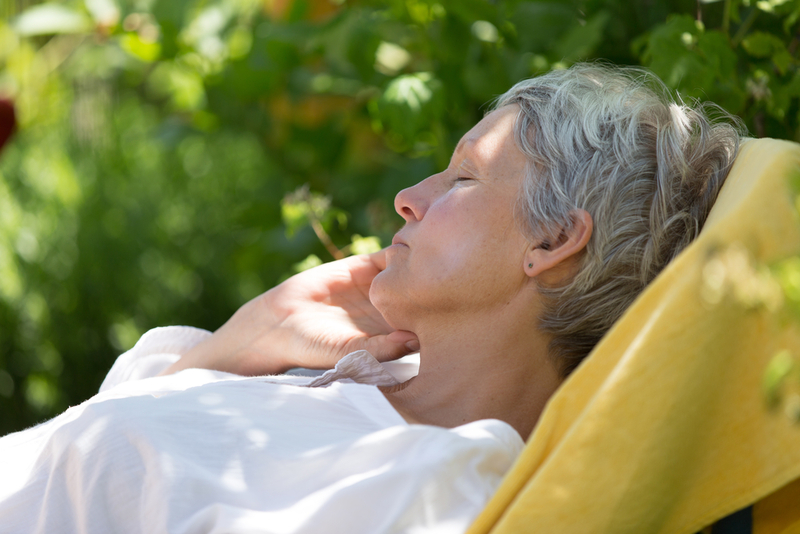 For older adults with symptomatic OSA, treatment can reduce daytime sleepiness and improve quality of life. What to do if you’re concerned: Helpguide.org’s page on sleep apnea has a useful 7-item questionnaire, to help you determine how likely it is that symptoms are sleep apnea. You can also ask the doctor about further evaluation if you’ve noticed a lot of daytime sleepiness. To be diagnosed, you’ll need to pursue polysomnography (objective sleep testing) either in a sleep lab or with a home sleep testing kit. Whether or not you pursue an official diagnosis for SRBD, avoiding alcohol (and probably other sedatives) is likely to help. 3. Restless leg syndrome (RLS). This condition causes sensations of itching, crawling, or restlessness as a person is trying to fall asleep. The symptoms are unpleasant but not usually painful, and improve with movement. The exact biological underpinnings of this problem remain poorly understood, but it seems to be related to dopamine and iron levels in the brain. It is not thought to be related to neurodegeneration. How common it is: Studies suggest that 5-15% of the general population meet criteria for RLS, but only 2.5% of people are thought to have clinically severe symptoms. Poor health, older age, low iron levels, and being female are some risk factors. It also tends to run in families. Why it’s a problem: RLS has been associated with depression, anxiety, and sleep-onset insomnia. It can also get worse with certain types of medication. What to do if you’re concerned: Read up on RLS (Helpguide.org’s page seems very good) and then talk to a doctor. Generally, you don’t need polysomnography but you should probably be checked for low iron levels. You can read about possible non-drug and pharmacological treatment options at Helpguide.org. 4. Periodic Limb Movements of Sleep (PLMS). This condition is not easily treatable, but I’m listing it since I’ve discovered it’s much more common than I realized. PLMS causes intermittent movements while asleep, usually in the lower limbs. It can affect the toes, ankles, knees, or hips. The movements may or may not wake the person up; they can be annoying to a bed partner. How common it is: Studies estimate that 45% of older adults experience PLMS. Many such older adults are otherwise healthy. However, PLMS is also often associated with other sleep problems, such as restless legs and sleep apnea. Experts believe that it’s fairly rare for people to experience clinically significant sleep disturbances solely due to PLMS. Is it a problem? PLMS can be an issue mainly because it’s associated with other sleep problems. Most people who experience PLMS don’t notice it much, although some do find it bothersome. Only a few studies have attempted to treat isolated PLMS, and it’s not clear that there is a reliable way to treat this. In its 2012 guideline on treating restless leg syndrome and PLMS, the American Academy of Sleep Medicine concluded that there was “insufficient evidence” to recommend pharmacological treatment. 5. Insomnia. Insomnia means having difficulty falling asleep or staying asleep, despite the opportunity to do so (e.g. being in bed), and experiencing decreased daytime function because of this. I consider this the grand-daddy of all sleep problems, because it affects so many people in middle-age and older age. How common is it: Very common, and it becomes even more common with aging. One study found that 23-24% of older adults reported symptoms of insomnia. Why it’s a problem: Insomnia has been associated with anxiety, depression, fatigue, worse quality of life, cognitive decline, and a variety of other worse long-term health outcomes. Insomnia is a very common complaint among family caregivers and older adults. Fortunately, research has shown that it’s possible to treat insomnia effectively, although it does often take a little time and effort. Before I go into the recommended treatments, let me say it again: you should only use sedatives as a last resort. That’s because most medications that make people sleepy are bad for brain function, in both the short-term and long-term. Benzodiazepines such as lorazepam, alprazolam, diazepam, and temazepam (Ativan, Xanax, Valium, and Restoril) are also habit-forming. It can be a lot of work to wean people off these drugs, but research has proven it’s possible. Plus, in my own personal experience, it becomes extremely difficult once a person has started to develop a dementia such as Alzheimer’s, because then their behavior and thinking can get a lot worse if they are a little sleep-deprived or anxious. (In the short-term, almost everyone who tapers off of sedatives has to endure a little extra restlessness while the body adapts to being without the drug.) But letting them continue to use their benzodiazepine puts us in a pickle, because it also keeps them from having the best brain function possible, is associated with faster cognitive decline, AND increases fall risk. The key to successfully stopping sedatives for sleep is to very slowly taper the drug under medical supervision, plus add cognitive-behavioral therapy or other sleep-improving approaches if possible. For more on this topic, and for a handy (and research-proven) consumer handout that helps older adults stop benzodiazepines, see “How You Can Help Someone Stop Ativan.” This post also addresses the question of whether it’s ever okay for a senior to be on benzodiazepines. Now let’s review some proven approaches to improving sleep in older adults. Cognitive-behavioral therapy for insomnia (CBT-I). This means special therapy that helps a person avoid negative thought patterns that promote insomnia, along with regular sleep habits, relaxation techniques, and other behavioral techniques that improve sleep. It has a good track record in research, which was recently covered by the NY Times. A new study also confirmed that CBT-I also benefits people who have insomnia combined with other medical or psychiatric conditions. CBT-I can be done in person, and is also effective when done through online programs. Two online programs with proven clinical efficacy are Sleepio (see here for the study) and SHUTi. CBT-I may incorporate several techniques such as stimulus control, and sleep restriction therapy. This Mayo Clinic page has a nice list of specific behavioral therapy components that might be included in CBT-I for insomnia. Mindfulness meditation. A randomized control trial published in April 2015 found that mindfulness meditation was more effective than “sleep hygiene,” to improve the sleep of older adults with a variety of sleep disturbances. Older adults assigned to mindfulness completed a weekly 2-hour, 6-session group-based course. Local in-person courses to learn mindfulness are often available; search online to find one near you. They may also be available at certain senior centers. An online version of the course used in the study is available here. Several smartphone based apps propose to help people with mindfulness. They are reviewed in the scholarly literature here. I personally have used Headspace and like it. Exercise. Exercise is often thought of as a treatment for insomnia, but the evidence seems weaker than for CBT-I. A review article published in 2012 concluded that the effect is modest. A more recent randomized trial comparing CBT-I to tai chi, for insomnia in older adults, found that CBT-I was more effective. Although exercise is obviously very important to health, don’t rely on it as the primary way to try to solve sleep problems. It’s also possible that exercise may help insomnia, but a fascinating small study covered in the NY Times suggested that in people with chronic insomnia, it can take a few months for exercise to have an effect on sleep. Are there any medications or supplements that are safe and effective? Benzodiazepine drugs and sleeping medications such as zolpidem (brand name Ambien) are definitely risky for older adults, as they dampen brain function and worsen balance. If you or your loved one is depending on such medications to sleep, I recommend you get help tapering off, as described above. Most older adults can learn to sleep without these medications, although it can take a little effort to wean off the drug and learn to get to sleep without them. Many over-the-counter (OTC) medications that make people sleepy are also a problem, because most of them are “anticholinergic,” which means they interfere with a key neurotransmitter called acetylcholine. A very commonly used anticholinergics is diphenhydramine (brand name Benadryl), a sedating antihistamine that is included in most night-time analgesics, but many prescription medications are anticholinergic as well. So those are the medications to avoid if possible. Melatonin: Melatonin is a hormone involved in the sleep-wake cycle. A 2007 study found that melatonin improved the sleep of older adults and did not seem to be associated with any withdrawal symptoms. However, in the U.S. melatonin is sold as a poorly-regulated supplement, and studies have found that commercially sold supplements are often of questionable quality and purity. So melatonin may work less reliably here than in Europe. Trazodone: Trazodone is an older weak anti-depressant that is mildly sedating. It has long been used by geriatricians as a “sleeping pill” of choice, as it is not anticholinergic and seems to be less risky than the alternatives. A small 2014 study found that trazodone improved sleep in Alzheimer’s patients. For a detailed and technical review of sleep medicines in older adults, this article is good: Review of Safety and Efficacy of Sleep Medicines in Older Adults. Now that we’ve covered the top causes of sleep problems in older adults and some proven ways to treat insomnia, I’d love to hear from you. What sleep problems have you been concerned about? And what’s helped you improve them so far? For information on evaluating and managing sleep problems in people with Alzheimer’s or other dementias, see this article: How to Manage Sleep Problems in Dementia. What about nighttime cramps….toes,feet,legs? Whenever I stretch I develop cramps which require me to exit the bed to apply pressure to the affected area. I’m 74, and have been experiencing cramps for about a year. BTW, I really enjoy your emails. They are often applicable to me and my spouse who is 77 (soon). The subjects are informative and written in easy to understand non-technical language. You also provide links to allow us to obtain additional insight into the subjects of your writings. Thank you for this detailed and specific feedback re the articles here; it’s nice to know you find the info useful and very helpful to know just what it is that you appreciate! Basically, you want to first make sure they aren’t being caused or exacerbated by medications or underlying medical problems. Diuretics are a common medication that can make them worse. For treatment, a randomized trial published in 2012 found that a 6 week nightly stretching program reduced nighttime cramps. You can read the full article — which includes pictures showing the stretches — for free here. It used to be common for doctors to prescribe quinine for nighttime cramps, but that’s now quite discouraged because 2-4% of people can have serious side-effects from quinine, including palpitations and bleeding problems. That said, quinine is in tonic water so some people do take 6 oz of tonic water at night for cramps. If you are interested in trying this, I recommend you talk to your doctor first to see if you have any particular medical problems that predispose you to side-effects from quinine. Another medication that is sometimes recommended for nighttime leg cramps is diphenhydramine (brand name Benadryl) but I of course am STRONGLY against that advice for seniors, because that’s a brain-slowing anticholinergic drug which has been linked to developing dementia. Good luck, and thank you again for your comment and terrific question. I’m surprised you don’t mention magnesium for cramping. Many older adults are deficient in magnesium due to medications and diet. I’ve found a good quality magnesium citrate supplement very helpful. I also love your blog and refer others to it! Thanks! Thank you, glad you find the site helpful. Yes, a few studies suggest magnesium can help with insomnia (see here and here). However, I would recommend that an older adult check with their doctor before beginning a magnesium supplement. Decreased kidney function (fairly common among seniors and many don’t realize they have it) impairs magnesium excretion, so it seems wise to check on kidney function and magnesium levels before taking a supplement regularly. Thanks for bringing up this comment. Our family suffers with leg cramps. The cause for all of us seems to be dehydration and balancing the electrolytes. Too much water can dehydrate as well as not enough. With so many concerned about salt there are many that don’t get enough salt. Thanks for sharing your story. Some people do seem prone to electrolyte imbalances. They can also be caused by medications, or occasionally certain issues relating to the kidneys. If an older person reports frequent leg cramps, I often do check on their electrolytes. REM sleep behavior disorder is not very common, and affects an estimated 0.5% of adults. It’s a condition in which people move physically during REM sleep; usually the body is almost paralyzed during REM (“rapid eye movement”) sleep. REM sleep behavior disorder has been linked to brain changes, including the type of neurodegenerative changes that lead to Parkinson’s disease and Lewy Body dementia. For more on this condition, including risk factors, see this page from the Mayo Clinic. Since brain changes and other risk factors for this disease become more common as people age, this is a problem that mainly affects older adults. Great article! Thanks for this great overview on sleep problems. I have read recently that lavender essential oil can help people fall asleep. It even has shown benefit for those who have dementia. Any comments on this? Thanks again! Yes, lavender oil has been studied for insomnia and some studies suggest it can help. It’s also been used in aromatherapy to treat agitation in dementia patients. Topical therapy usually has a low risk of side-effects, so it’s certainly something that an older person or family could try, to see if it helps. For oral therapy (i.e. taking lavender oil capsules), my concern would be that we don’t really know what the short-term and long-term risks might be. Furthermore, in the US, herbal supplements are unregulated and chemical studies have shown that the actual ingredients often don’t match with the claimed composition on the label. So I might be hesitant if one of my older patients wanted to try such an oral therapy. Prazosin was originally used as a blood pressure medication, because it relaxes blood vessels. It is no longer used often for blood pressure control but is used in the treatment of PTSD and apparently also helps reduce nightmares. I’m not sure what the long-term side-effects might be, but it’s good for you to consider this question and I recommend you ask your doctor and pharmacist for more information. From a geriatrics perspective, medications like prazosin can cause or worsen a drop in blood pressure when standing, and this has been associated with falls in older adults. So if you’ve had any concerns about falls, light-headedness, or low blood pressure, then this could be an important side-effect of prazosin to check for. Thank you Dr. for your very useful and helpful information. Thank you, I’m glad you find it helpful. Really appreciate the efforts you put into your blog. Being able to reposition (for comfort and reduced bedsore risk) is also important to get “good sleep”. Many of our callers (especially Parkinsons) find it impossible to independently reposition (or even get in/out of bed) creating a high risk of injury (and loss of quality sleep) to the spouse/caregiver. Our company FriendlyBeds.com offers special bed equipment for this purpose. 1) He can sleep for only 3-4 Hrs on every alternate day, but between the alternate days he cannot sleep at all. 2) On every alternate day , he has an urge to go to washroom to urinate ( the frequency is typically is 1 time/hour). 3) He has taken some antibiotics like NEXITO PLUS but at the beginning for a week they work , but now they are not helping. 4) He feels exhausted day by day and facing memory problems. 5) He did not drink nor smoke and has a good overall health, he was sleeping comfortably before last 3 months with no issues. He was sleeping well for about 7-8 hours daily. If you can please help here, i will really appreciate. If your father was sleeping well until 3 months ago and now has developed all these problems, then I would say he certainly needs a thorough and careful medical evaluation to figure out what might be the cause of these problems. If he has already seen a doctor, then either you need to ask that doctor more questions or otherwise request further evaluation, or you should go see a different doctor. Regardless it’s important to ask the doctor to explain what they think might be going on, what makes them think this, and what they are planning to do next. Heya, Thank you so very much. Really appreciate the efforts you put into your blog post. Loved the way you explained in detail. Best wishes & Regards. I appreciated this article because I do have sleeping problems, including sleep apnea. Thanks for the good tips. These tips are really great. Hope it gonna works for my sleeping problem. Thanks a lot for sharing such awesome ideas. I also suffer from bipolar disorder, depression, anxiety, PTSD, COPD, weight issues,chronic pain, memory problems, and isolation. My mother had cancer, then Alzheimer’s (is there such a thing as severe?). I’m a little concerned about where I’m headed. I’m on an arms-length list of meds and I’m trying to weed them out due to blogs, such as yours, medical posts and publications concerning long term use of antidepressants (40mg paxil and 200mg lamotrigine), from 17 to present. I think I’ve built up a resistance. Is that possible with this sort of medication? Believe me I could go on. I just wanted to say how much I appreciate your efforts to clear up these hazy issues via the links you share I don’t believe I’m the only one facing this. I’m just one of the few that’s not ashamed to admit it. Thank you and any information you can share with me will be put to good use. Thanks for sharing your story. It certainly sounds like you’ve had to cope with way more challenges than most people your age. It sounds physiologically plausible for people to build up a resistance to certain medications, or for them to stop working as well. In general, we don’t know as much about long-term side-effects as we do short-term side effects. Your situation is definitely trickier than most. You’ve been on medications for a long time, and you have lots of health diagnoses, which are interacting with each other and perhaps with your medications. It’s virtually always possible to make progress improving one’s health and wellbeing, and it’s usually possible to reduce medications at least somewhat. But the more complicated a person’s medical history and the more medications they take, the more involved is the process of providing help, in sorting through the options regarding treatments, and in attempting reductions in medications. I think it’s wonderful that you are making this effort to be proactive about your health. I hope you will be able to find some good clinicians to work with you in person, to slowly and carefully explore other options that may be available. Certain types of psychotherapies can help make pain and insomnia more manageable. Developing non-drug ways to manage anxiety and other feelings is also good for brain health. If you let your prescribing doctors know that you’d like to be on less medication if possible, they may be able to help find ways to do this. My cousin has been thinking about going to a sleep disorder clinic for a while now. She is wondering if there is anything that she could do in the meantime to lessen the symptoms. I will let her know that exercise is a great way to get in shape and slowly help with sleep. I had no idea that sleep apnea can cause so many serious problems. In my family, we always made fun of my dad for the funny way he snores, but I think he may have OSA. I should warn my dad that it can cause stroke and heart failure, among the other related health issues you mentioned. Maybe he should be talking to a sleep specialist about all this. Yes, if you think he might have sleep apnea, I would definitely recommend he get evaluated by a medical professional. Well, for me it helped listening to nature sounds. Yes, some people find it helpful to listen the recordings of waves or other forms of nature “white noise.” Such recordings can be found on YouTube and elsewhere. I usually use a sensory weighted blanket to help my self out. But I think if you solve it naturally, its better. According to Pubmed, weighted blankets have not been studied for insomnia in adults. As best I can tell, they’ve mainly been studied for children with autism. A randomized study published in 2014 found that weighted blankets did not help children with autism sleep longer, or improve behavior. I would not particularly recommend this approach, given it hasn’t been studied and there’s not much evidence that it’s likely to help. Sounds like an issue related to the diagnosis coding software. I would say, try to not worry about it. Clinicians generally have very little control over the administrative innards of the software they are using. A good friend of mine has been looking into the different to combat sleep apnea. She has been calling friends and family to find effective ways to do this and called me the other day. I will let her know that exercise is a great way to help as well as a more professional treatment. A meta-analysis published in 2014 found that exercise is associated with an improvement in sleep apnea symptoms, however it’s pretty modest in comparison with other treatment approaches. The HelpGuide article on sleep apnea that I link to in the article lists treatment options. Exercise is always good, but for sleep apnea other treatment should be pursued as well. I fall asleep but wake up after 10-30 minutes and can’t get back to sleep for hours if at all. I can’t find any information on help for this problem. That sounds like a very frustrating problem. I would encourage you to bring it up with your usual health provider. Generally, the first step is to evaluate for medical problems that might be contributing to this. If it appears to be primary sleep maintenance insomnia, then there are a variety of non-drug techniques that can be used to both reduce the chance that you’ll wake up often, and also help you fall back asleep more easily. Very interesting article. I’ve been having problems staying asleep. I fall asleep okay, but wake up about after one hour, then again in a couple of hours. I use the bathroom everytime I wake up. Sometimes I get 4 or 5 hours of straight sleep. I feel so fatigued a lot of the time. I’ve also been told I have fibromyalgia. Some nights I have a lot of leg jerks. I recently did an at home sleep study and it came back that I didn’t have sleep apnea. My doctor prescribed temazepam 15mg. before bedtime. I’m trying to decide if I should take it or not. After reading your article I’m really thinking it might be a bad thing to start. I’m 74 years old. I need to get my rest as my hubby has health issues such as dementia and I do need to be alert if he needs me. Any advice would be appreciate. Sorry you’re having sleep difficulties. Getting good rest is certainly important, especially when one is helping someone with dementia. I think you are wise to do a little research before starting a sleep medication such as temazepam. It is a benzodiazepine and they are problematic for older adults, plus they are hard to stop. I would recommend you discuss some of the other insomnia treatment options with your doctor. You could ask about trying an online CBT program for insomnia. Trying to find ways to urinate less during the night might also help. If a medication is absolutely necessary, I have mentioned a few in the article that tend to be less risky in older adults. Good luck! Thank you for bringing this up, Bonnie. I am searching the web for the same reason. My mom had this problem, if she awoke during the night she would not be able to sleep again until the next night. Now I am over 60 and having the same problem. Mom and I had/have SEVERE, chronic migraine and I suspect for us this is an aspect of migraine. Doctors have told me that whatever part of the brain swells will yield corresponding symptoms. I wish you the best. Hi, I was prescribed Clonazepam for extreme sustained insomnia in 2012 during a very stressful period, and continued to use it until August 2017 when I weaned myself off from it – the clonazepam was no longer working and appeared to be inducing insomnia rather than helping – I started sleeping better than I had in years, even having dreams again! Recently, my brother stayed with my husband and I while he suffered through an intense illness. During this time, he consistently needed my assistance during the night – about a week. It’s been 5 weeks since my brother recovered and left, and five weeks since my insomnia returned with a vengeance! I am lucky to get 4 hours of sleep per night, typically waking every two hours. Unfortunately, I have paradoxical reactions to many typical sleep aids, Ive tried Melatonin, 5 HTP, tryptophan, teas, Trazadone (strung me out!) hops, etc! I exercise consistently, I do not eat a late or heavy dinner, coffee is restricted to one cup and an espresso before 10 AM, I keep my bedroom cool and comfortable, I do not drink alcohol to excess, and eat a clean diet. I have established bedtime routines. Several of my siblings have insomnia, as did my paternal grandmother and my father. I am 61, a woman and at my wits end! HELP! Sorry that your insomnia has recurred. You’ve tried a lot of “sleep hygiene” approaches, which is good but often they aren’t enough. If you haven’t already tried it, you could look into approaches that address the mental patterns that can reinforce/worsen insomnia. The Headspace meditation app has a whole 30 day series to help people improve their sleep, plus a special session for falling back asleep during the night. Or you could look into one of the CBT-I online programs. Good luck and hang in there, it is definitely good to avoid benzodiazepines if at all possible. i’m On different kind of medication especially warfarin daily, exforge/ranexza/gabapanten/exzelon and suffering with sleep apnea/cops/2 times opened heart surgeries (cabdg) aortic &mytral valve change with 2 arteries bypasses/bad spinal column& brain mri. My dr prescribed me primedon pills to stop my my essential hand tremor. Would you kindly help/advise me what to do if the primedon pills could help me sleep without any risk. Makes me stop my progressing dementia(forgetful) Thank you doctor and May God you more. Primidone is considered an effective treatment for essential tremor but is not a known treatment for dementia or memory problems. It does tend to cause sedation and can affect balance. I would recommend you discuss the likely benefits and risks with your health provider. Good luck! I would recommend seeing your health provider soon about this issue. My 88 year old mother moved to a personal care home 4 weeks ago. She has been having a very difficult time sleeping due to nightmares that seem very, very real to her! They are giving her Temazepam 30 mg and Ativan 1 mg with no effect. She is not sleeping, and is exhausted. The lack of sleep is impacting her daily activities, she cannot even feed herself at times. Suggestions? In geriatrics, we generally don’t recommend using benzodiazepines such as temazepam or lorazepam (brand name Ativan) for sleep issues, because they can affect thinking and falls, and are associated with longer term risks. In your situation, it sounds like these medications are not even helping much in the short term, so I would certainly recommend discussing this with the doctor and asking if another approach can be tried. Thanks, Dr. Kernisan, I had a hard time falling asleep or staying asleep. Unfortunately, it is associated with anxiety, depression, fatigue, worse quality of life, cognitive decline, and a variety of other worse long-term health outcomes. Recently, I replaced my old mattress with a new one that I got from an online mattress store. To my surprise, it helped me sleep better and improved my sleep cycles. Yes, for some people changing the mattress or sleep surface can help, especially if they were previously experiencing pain or discomfort with the old mattress. I’m new to your site, and love it. My understanding is that one’s sleep architecture changes as you age — specifically the amount of slow-wave-sleep decreases. Can you talk about the implication of decreased slow-wave-sleep on people as we age? And what can we do to increase slow-wave-sleep? Thanks! Thanks for your kind words about the site. Yes, sleep architecture does change as one gets older. The exact reasons why are still being sorted out by researchers. To learn more about this topic and the implications for aging, I recommend Professor Matthew Walker’s book Why We Sleep. He is the head of the Sleep and Neuroimaging Lab at UC Berkeley, and has done research specifically on sleep and aging. If I remember correctly, the decrease in slow-wave sleep seems to be a big part of the reason why memory and learning get worse with normal aging. They are currently researching ways to counter this usual change in sleep architecture and the related cognitive changes. It’s possible that a change in your work schedule or daily activities could affect your sleep. It can also take some time to adjust psychologically to being retired; there are benefits but for some people it’s discombobulating. If you are having difficulty with your sleep, I would recommend bringing this up to your doctor so that you can be evaluated for health issues that might be affecting your sleep. My father is 74 and suffering from Insomnia. He only sleeps for a hour at a time at night. He is up most of the night. He has a heart condition and is on blood thinners. The doctor prescribed sleeping pills for him. Sorry I do not know which ones. However, they are not working. He complains of itching and achy muscles during the night. One night he complained of stomach cramps. I am starting to think the symptoms are associated with the various medications prescribed by the doctor. He can barely talk, not eating well and his cognitive skills are failing. I was thinking about the weighted blanket but he complains about being hot during the night. I also considered hemp seed oil but read about the side affects with blood thinnners. Our next step is golden milk to see if that will help. My mother and I really feel that it’s time to stop the sleeping pills. Is there anything else that we can do? Sorry to hear of your father’s sleep difficulties. It sounds like he needs a comprehensive evaluation for his uncomfortable symptoms, such as the itchy, achy muscles, and stomach issues. It’s certainly possible that medication side-effects could be playing a role. His cognitive issues and difficulty talking also sounds concerning, so I would recommend an evaluation specifically for that as well, possibly with a neurologist. The sleeping pills might be making his thinking worse. However, most people experience withdrawal symptoms and distress if sleeping pills are suddenly stopped; they usually get rebound insomnia and can also get irritable, anxious, or even more confused. Depending on the type of sleeping pill, they can also experience other withdrawal symptoms. So, you generally don’t want to just stop sleeping pills; instead it’s usually best to talk to the doctor about a safe way to slowly taper the dose down. Good luck! I am 81 year old widow who slept well when I was working, but after retirement 15 years ago began waking up around 2-3 a.m. and not getting back to sleep. Also, my feet and hands seem to itch when I wake up. I find that time release melatonin works better than anything, although there is still a window when I wake up; however after 20-30 minutes I usually go back to sleep (the time release kicking in?) and sleep for several more hours, sometimes more than I need to sleep. Is this normal? I also have recently been diagnosed with microcolitis and gluten sensitivity, so when I wake up I often need to go to the toilet for loose b.m. as well as urination. I don’t eat gluten anymore, and things have improved, but there is still some inflammation there. I actually don’t have much experience with time release melatonin, so cannot say whether your experience is common or not. If you feel adequately rested when you wake up, that’s probably what is most important. You may want to ask your usual doctor about the itching when you wake up, especially if it persists, is getting worse, or if you’re experiencing any other symptoms or difficulties related to sleep. good luck! My problem is that I wake up after about five hours good sleep, need to go to the bathroom, and then find it really hard to get back to sleep. What is the cause of this and how can I change things so that I get to sleep for more of the night? Thanks. I can’t really say what the cause is, but I think your issue is not uncommon. If there is no medical problem keeping you awake after your bathroom trip, I would guess that either your body feels it’s gotten enough sleep (are you napping during the day? ), or that your difficulty falling back asleep might be related to certain behaviors or thoughts. The app Headspace has a package of sleep meditations, including one specifically designed for when you wake up during the night and have difficulty getting back to sleep. You could try something like that and see if it helps. I would also recommend discussing this type of sleep difficulty with your health provider, as they will be in a position to ask more questions and help you correlate this issue to any other health issues you might be experiencing. Good luck! It is extremely important to block all light from your sleeping environment. Blackout windows, no cell phone or computer lights, etc. When you rise to use the bathroom, use a small flashlight for safety and navigating, do not turn on lights. In desperation I tried the Zeez sleep pebble. After two weeks this began to prove effective. I still wake up regularly during the night but am able to go back to sleep. MAGIC. Interesting. I hadn’t heard of this but I looked it up, it seems to be some kind of small device that emits subtle pulses sensed by the brain. No published research on it or a similar technology that I could find, so I can’t say what the risks are, but they are presumably minimal, compared to all the waves and frequencies we are surrounded by in our wireless-enabled world. I’m glad your sleep has improved. Sorry for your long history of sleeping difficulties. I would recommend seeking out a sleep specialist, they may have additional ideas on how to help you. Good luck! One thing I’ve found that contributes very significantly to neutralizing insomnia is Yogurt. That is: homemade yogurt. I have not tried the industrially produced type, as it usually contains much less beneficial bacteria — some brands contain insignificant amounts of beneficial bacteria —, and usually contains all kinds of added chemicals that may disturb your sleep, and may even affect your health in a negative manner. Homemade yogurt has a very significant calming effect on the digestive system. Homemade yogurt is a significant contributor of Tryptophan and its absorption by the small intestine due to its liquid form (Tryptophan is an important precursor to melatonin, serotonin, and some other neurotransmitters and biochemicals — https://en.wikipedia.org/wiki/Tryptophan). Homemade yogurt is a significant contributor to the proper balance of the intestinal flora. 60 to 80 grams of homemade yogurt immediately before going to bed. If you typically wake up during the night and usually go back to sleep about an hour later, eat another 60 to 80 grams of homemade yogurt immediately before going back to bed. For your information: With today’s industrial process for pasteurizing milk, you do not need to heat it up to a high temperature to kill bad bacteria; they are already dead from the pasteurization process. All you need do is bring its temperature to proper yogurt making temperature. I’ve been using this method for years, and never ran into a problem. If the milk would not be pasteurized, then of course you’d need to heat it up to high temperatures to kill bad bacteria. I had not been aware of any research on yogurt and sleep, however when I just took a look, I see that the results of one small study suggest that fermented milk can help with sleep. For people who tolerate yogurt without digestive distress, presumably there’s little downside to trying this strategy. Based on the available evidence, I would say we don’t know if it’s likely to work in most people, however. It may also depend on one’s genetics and individual microbial gut flora. Sorry to hear of these issues and how terrible that you were punched! If you feel you are continuing to have symptoms related to this incident, I would recommend you let your health providers know, so that they can help you determine whether additional evaluation is needed. Sorry if your doctor’s colleagues are not being helpful; unfortunately I cannot offer more advice online, the type of advice you need can only be provided within the context of a doctor-patient encounter. You may want to try requesting an in-person appointment with one of your doctor’s colleagues, if they are unwilling to offer advice by phone or messaging. Good luck! I have been on benzos for 40 years! Currently on 15 mg of Temazepam. I have suffered profoundly from lack of sleep. It is idiopathic in nature. I was diagnosed by Dr. Peter Hauri, a renowned sleep psychiatrist. I cannot fall asleep without a Temazepam (I have been on 7 or 8 sleeping pills thorugh the years). I sometimes cannot fall asleep, I sometimes fall asleep but wake after a few hours and cannot sleep again. I sometimes am awake most of the night. Just very recently, out of the blue, when I take the Temazepam, I am asleep in minutes — something that NEVER happened. A person I know who has written a book on insomnia told me she does not believe the Temazepam is causing me to fall asleep so quickly. In fact she said, I do not believe that is the cause. So I am very concerned about why this is happening, out of the blue. Would you have any idea why she feels the sleep is not connected to the Temazepam? Is it possible for me to go off of Temazepam after 40 years. I am now 90 years old. Does he falling asleep so quickly have to do with that fact? I hope you can shed some light on this. I have tried CBT in the past but it did not work for me. I was never sleepy, just tired all the time. It is still that way. In terms of getting off temazepam at age 90, after taking it for 40 years…well, I think it’s technically possible to reduce the dose or taper off, but it would require some effort and you’d be most likely to find the change tolerable if the medication is decreased very very very slowly. Otherwise, although studies have shown that it’s possible to treat insomnia non-pharmacologically in older adults, I don’t believe any studies have focused on people your age. I would recommend discussing your concerns with your usual health provider. You could also see if you can find a sleep specialist with particular experience with people your age. Good luck! I used Pravastatin for a number of years without a problem with muscle aches, etc. My cardiologist inserted a stent in my heart about six years ago and insisted that I use Crestor as a statin. Within 6 months i started having trouble with my muscle coordination and I could not sleep. I went back to Pravastatin. Most of the side effects from Crestor went away except I was unable to go to sleep. I have used Temazepam, 15 mg, when I was traveling overseas and now find that it is the only drug that seems to work. I have been taking it for the last five years along with one capsule of Unisom when I wake up at night. I am now having memory problems which continue to become more serious. I have talked to National Jewish in Denver without results. No one seems to understand why I have the sleep problem. I have tried cutting the Temazepam capsule, but it is a time release and I tend to loose part of the drug. I would appreciate any help that you can give. There are many things that can cause sleep problems, and it’s possible that yours are due to more than one factor. We do know that some forms of brain change that cause memory changes also change sleep patterns, so it’s possible that the two issues are related. You would have to work closely with a health provider to be carefully evaluated for your sleep problem, to see if there’s a cause or contributor that can be treated without medication. Unfortunately if you are having memory issues, both temazepam and unisom will further slow down your brain and they are likely to make your thinking worse in the short tem. Sometimes to help people taper a benzodiazepine drug like temazepam, we switch to a liquid formulation since that can be tapered down more easily. I don’t think temazepam is available as a liquid however, so you would have to work with a health provider to switch to a similar medication that does come in liquid form, and then slowly taper it down. Good luck!